Use this very unique keychain as a daily companion for your car or door key, as a pendant for your purse or your phone case. It is also a great gift for a fashionable (Paris) friend. 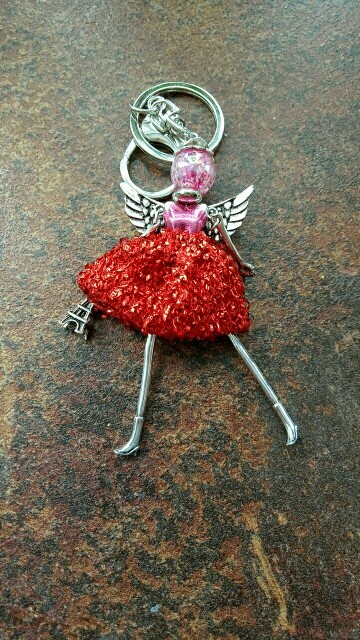 The keychain is available in different colors with or without angel wings. Choose your favorite one in the color drop-down menu. Each Paris girl holds a little Eiffel Tower in its hand. The keychain comes with a ring and a lobster claw clasp (snap hook) and is approx. 5″ high (13.5cm). If you buy from us, you don’t have to think about shipping cost. We offer FREE worldwide shipping on any order. However, there are some locations we are unable to ship to. If you are located in one of those countries we will contact you. *This doesn’t include 1-5 day processing time. For logistical reasons, items in the same purchase will sometimes be sent in separate packages. Please note, that we are not responsible for any custom fees once the items have shipped. By purchasing our products, you consent that one or more packages may be shipped to you and may get custom fees when they arrive to your country. Our experience is that, in most cases, there are no additional import costs imposed on customers. For more information about returns and refunds, please read our Return and Refund Policy. If you have any questions, please contact us and we will do our best to help you out. Skirt fast disheveled, as well as good a doll. Very fast delivery Thank you!! Pupa just lovely will order more!